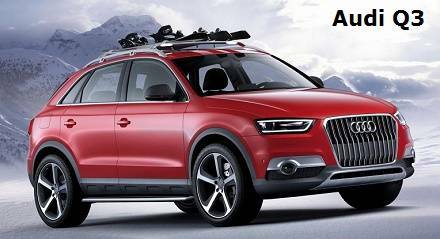 AUDI Q3 4x4: Audi's standard Q3 model is the smallest in their SUV range of chic crossovers. Even so, the engine spec and posh interior trim are truly unparalleled at this level. Fact: The Audi Q3 4x4 is bigger and taller than the A3. Some test drivers describe the small 4x4 as rather predictable. But, the German firm has created one of the best high performance crossovers available in the United Kingdom. The small Audi 4x4 Q3 SUV shares most of the familiar styling and technical specifications as its siblings in their three-tiered range. But, when you review the fine details, you will also recognize some shared hardware from the supermini A1. That said, it seems to lack the full-figure of the Q5. One of the most striking features of this smallish hatchback is the badge which it displays. This is the smallest Audi car with the RS badge. Thus, it is the only 4x4 Q production which also got turned into an RS model. The small SUV car is 'essentially' designed for tarmac roads. But, its raised ride height and optional four-wheel-drive might disappoint you over rough muddy tracks. You shouldn't get fooled into leaving this one behind. It got sizeable upgrades to the engine specification, interior and exterior design styling, and the uprated suspension. Mark the Audi Q3 as one to consider if you are looking to buy a small 4x4 car in the United Kingdom. The Audi Q3 hatchback has a surprisingly large stature. This comparison was part of ten best small 4x4 cars on the market. You might need extra vigilance through tight streets. Parking it may also be a challenge for some drivers. There is no doubt that the added suspension height is a benefit of a small crossover. Yet, some review it as a bit 'clumpy' over some of the typical British urban obstacles. That said, the car is definitely pleasant to handle around corners. This is despite the electric power steering feeling a little weak at times. It is definitely a small Audi car. But the Audi Q3 4x4 has an enviable array of engines. They start with the 140bhp 2.0-litre diesel with four-wheel drive. Almost every Audi Q3 car review suggests upgrading to the quieter 177bhp Quattro version of the same engine. The petrol alternative is a 2.0-litre turbo with 4WD and either 170 or 211bhp. They are both smooth and reasonably nippy. But, the middle diesel engine specs appear to provide the best mix of fuel economy data, performance, and usability for its owners. It hits the sweet spot between running costs and performance with 47.9mpg and CO2 emissions of 156g/km. 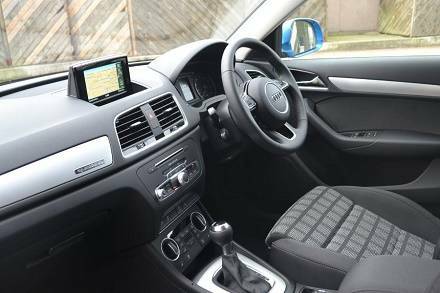 The inside layout of the Audi Q3 is smart yet functional. In fact, you would be forgiven for thinking there is as much space as the bigger Q5 - because there almost is! It is worth noting that the biggest difference is the engine mounting. It gets mounted 'across' the engine bay in the Q3, whereas it sits lengthways in the Audi Q5 model. All Audi Q3s get climate control as standard for the model. It was also good to see a proper phone and iPod interface inside the cabin. Note: Optional extras include an entertainment screen and communications displaying the satellite navigation. Audi cars are not usually cheap to buy and this one follows the line. Experts suggest caution when choosing from the options list. That will help to reduce the risk of losing out on your investment if you sell them as second hand vehicles. The train of thought seems that low-to-medium levels of accessories is a wise decision.